Helianthus is a genus of plants comprised of 52 species, all of which are native to North America. The Helianthus Annuus (sunflower) was cultivated in Europe. Sunflowers grow anywhere from 20 inches to 12.75 feet tall. The flowering heads follow the sun, going from east to west throughout the day. Photo courtesy of Jon Sullivan. In the early 16th century sunflower oil became a widespread cooking ingredient. 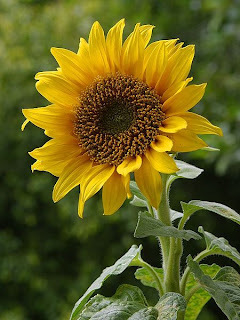 Leaves of the sunflower were used as cattle seed and stems contain a fiber that was used in paper production. Helianthus pollen is a fine and coarse powder that will be left on your hand if you brush it across the center of a sunflower. 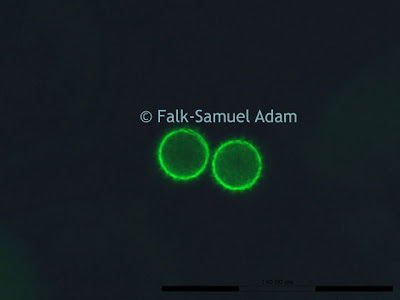 Image of Helianthus pollen captured with a fluorescence microscope using the Jenoptik CT3 microscope camera.